What does good school attendance look like? If your child does not attend school they will not achieve. We want all students to achieve high levels of attendance and give themselves the very best life chances and choices. 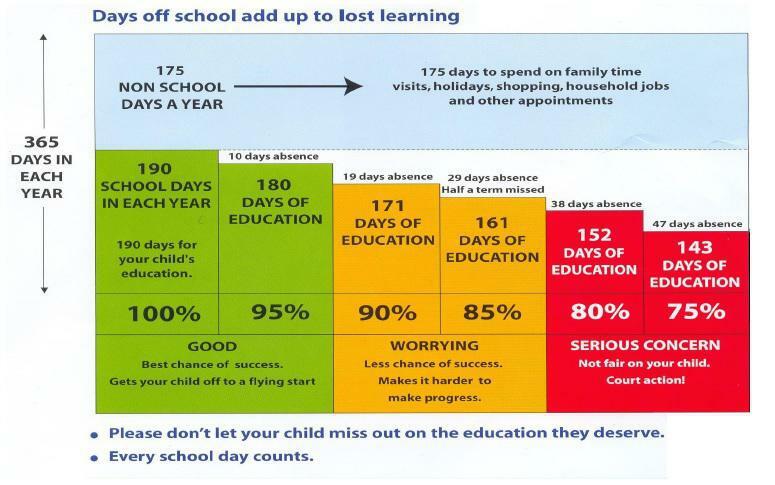 There are 175 non-school days per year for holidays, shopping and appointments. There should be little need, except in "exceptional" circumstances for your child to miss a day's education. 90% Attendance may look impressive but it means they miss 19 days of education in a year and risk dropping one grade in their achievement at school. If a child is to be absent from school due to illness, we ask the parents to phone the main school number by 9am on the first morning of the child's illness. There is also an answering machine out of school hours to leave a message. Bournemouth Park Academy supports other local schools in adopting the government recommendation that no absences for holidays will be approved as authorised during the academic year. Should parents book vacations during term time, they will do so on the understanding that this is without the consent or approval of the school. Medical appointments should not be made during the school day. If this is unavoidable you will need to show evidence of an appointment card to take your child out of school or to leave early.